We have created a comprehensive guide that tells you everything you need to know about solid surface shower systems, and why its versatility and longevity make it the best choice for commercial applications. What Should a Shower Do? The first, most obvious thing a shower needs to do is clean the person in it. Fortunately, that isn’t a high bar; Water + Person = Success. The other thing a shower needs to do is keep water contained. Whether you are talking about the shower at home or a communal shower in a locker room, the last thing anyone wants is the water to go everywhere. So what other basic requirements make a shower system successful? A shower should have minimal joints to reduce the number of places the water can escape. The more joints, the more places to caulk and waterproof, and the more places those precautions can literally come apart at the seams. Of course, while it is possible to get an entire shower system molded as a solid piece, it is impractical and expensive. A shower should be able to stand up to use and abuse. You don’t want a shower that will break down over time. While it may be cheaper up-front to buy a less durable material, the long-term costs will outweigh the initial savings every time. A classic example of this is the grout in tile showers. After a while, grout breaks down, allowing mold and mildew to grow under tiles, and even allowing tiles to come loose. A shower should look as good in 30 years as it does today. When I had to use showers in high school after Phys. Ed. 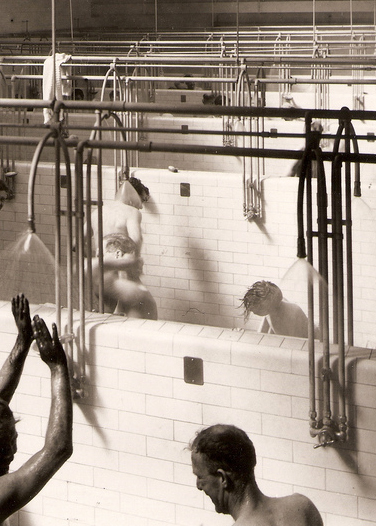 in high school, it was clear that my grandfather had used those same showers. They screamed 50’s nostalgia. The last thing you want to do is have to decide on replacing a shower for aesthetics rather than necessity. You should always take maintenance costs into consideration when you are deciding on a material. I’m not just talking about material repair and replacement either. You should think about the man-hours and cleaning supplies as well. Some shower designs require more effort to clean than others. Have you ever tried to clean grout? It isn’t fun. A shower should look as good in 30 years as it does today. The aforementioned needs are not only met but exceeded when you use solid surface as a material for showers. It’s easy to install, often being compared to wood for its ease of cutting and scribing. It’s completely solid, with no foam core, and it is completely non-porous, so you needn’t worry about mold and mildew growing like you would with grout between tiles. 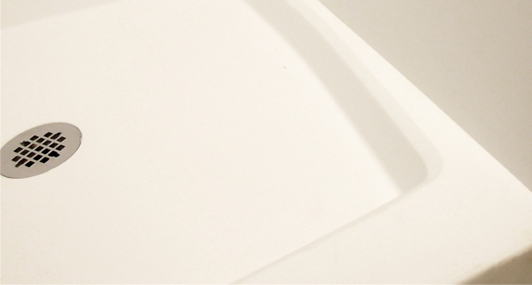 Solid surface is a man-made material originally invented by DuPont in 1957 and sold under the brand name Corian. 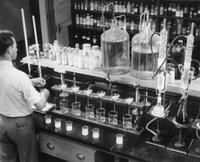 Once the patent expired, several companies started making their own variations of the formula. 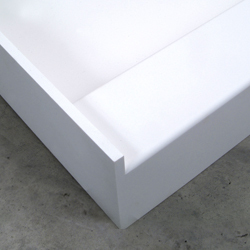 A homogeneous blend of poly-acrylic or acrylic resins and natural mineral fillers, solid surface is a completely non-porous material that is resistant to stains and naturally does not support the growth of mold, mildew and harmful bacteria. It is completely solid, with the color and pattern going all the way through the product. Matte finish is standard on most offerings, but gloss finishes are available. 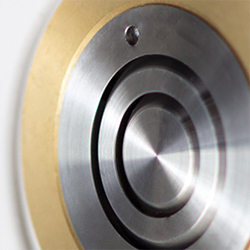 Regardless of the type of finish, there are no surface coatings to damage or disrupt. It also can come in almost any color imaginable, and can even mimic natural stone like quartz, granite and even marble. Since we are talking about showers, you should probably know that the lighter color you choose, the better off you will be. Dark and non-patterned colors tend to make soap scum more noticeable. 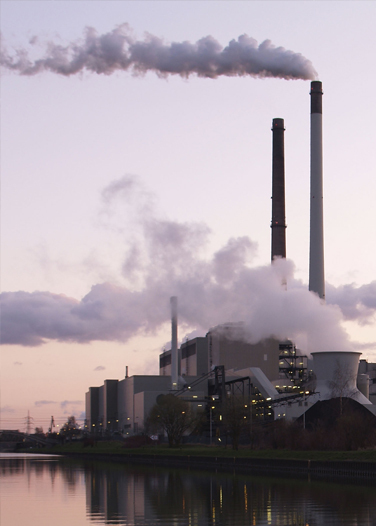 Volatile Organic Compounds (VOCs) are an important item to consider but is often overlooked. VOCs are released from solvents, paints, glues, and other products that are used and stored at home and at work. They are also emitted from oil & gas fields, burning wood, coal or natural gas as well as diesel exhaust. In layman’s terms, if left to harden naturally, it can take up to 90 days for the material to stop smelling, however oven-curing is an option that completely consumes free-radicals and virtually eliminates VOCs before it reaches the job site. Oven-curing is not available from all manufacturers, so it is important to ask. 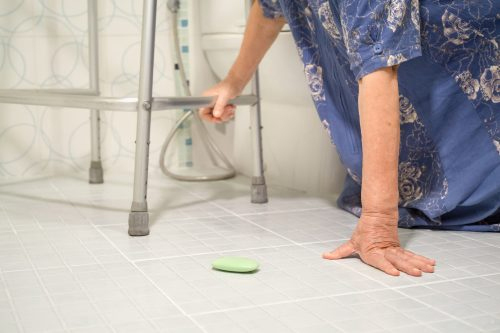 More than one in three seniors over age 65 fall each year, and the National Institute on Aging (NIA) says 80 percent of these falls are in the bathroom. According to the Centers for Disease Control and Prevention, every year about 235,000 people over age 15 visit emergency rooms because of injuries suffered in the bathroom, and almost 14 percent are hospitalized. More than a third of the injuries happen while bathing or showering. More than one in three seniors over age 65 fall each year, and the National Institute on Aging (NIA) says 80 percent of these falls are in the bathroom. Due to the multitude of unforgiving and slippery surfaces, bathrooms are very hazardous for the home. Solid surface’s unique pebble texturing – available on modular and manufactured bases – has been measured to the ASTM F462 coefficient of friction standard. The minimum coefficient of friction is 0.04 to pass the test. Matte finish meets minimum requirement at a coefficient of friction of 0.056. Pebble-Textured floor finishes offer ten times the slip resistance at 0.435. 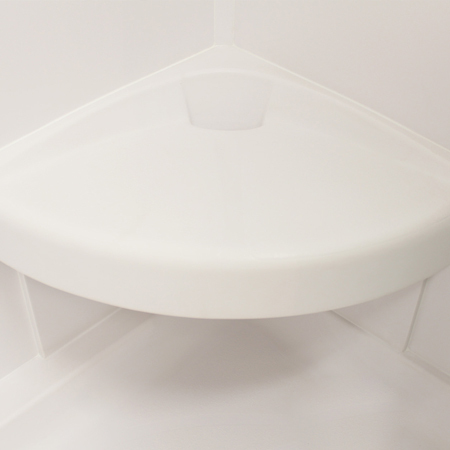 In addition to its slip resistance, solid surface shower bases can be equipped with ligature-resistant drains, in order to reduce the chance for self-harm, and remove the opportunity to hide contraband in the drain. These innovations are necessities for mental health institutions. It’s easy to install, often being compared to wood for its ease of cutting and scribing. When I first started working with solid surface showers, I had no idea there were so many parts that make up a shower base, let alone a complete shower system. Even after you talk about the individual components, there are different manufacturing types to take into consideration as well! It can seem a bit daunting at first, but let’s take it one piece at a time. 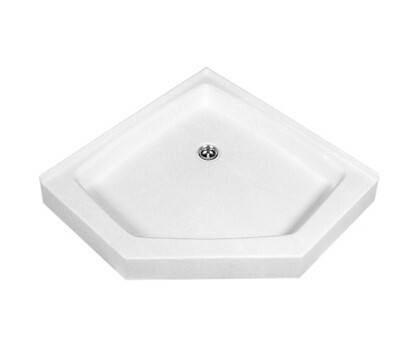 Solid surface shower bases – commonly referred to as pans, or receptacles – are the literal foundation of your shower. They come in a variety of shapes & sizes and are manufactured in several ways. The three methods we will be covering today are standard-sized modular, custom-sized fabricated, and custom sized manufactured. There is a lot that goes into making sure water is contained and goes down the drain successfully. Click on a component to find out more about what goes into a successful shower. Everything revolves around this component... literally. If the floor doesn't slope to the drain, or the drain doesn't line up with the plumbing, you are going to have a bad time. 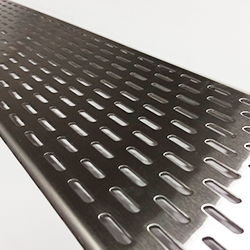 There are a number of drains styles to choose from, including standard, trench, and ligature resistant. 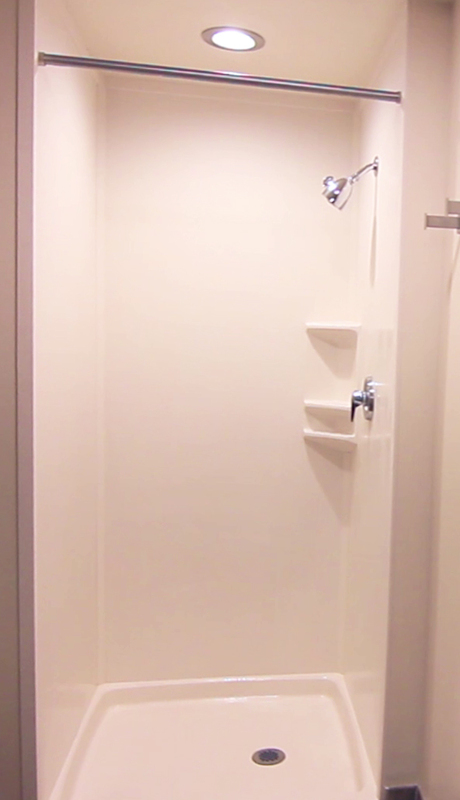 Does your shower need to be wheelchair accessible? Is there going to be a curtain, a glass door, or a solid surface door? Does the shower floor entry need to line up with the bathroom floor? All of these things need to be taken into consideration when designing your shower. Due to the multitude of unforgiving and slippery surfaces, bathrooms are very hazardous for the home. Solid surface’s unique pebble texturing – available on modular and manufactured bases – has been measured to the ASTM F462 coefficient of friction standard. The minimum coefficient of friction is 0.04 to pass the test. Matte finish meets minimum requirement at a coefficient of friction of 0.056. Pebble-Textured floor finishes offer ten times the slip resistance at 0.435. The water dam on a shower base is the insurance policy that ensures that all water remains in the shower base and goes down the drain. 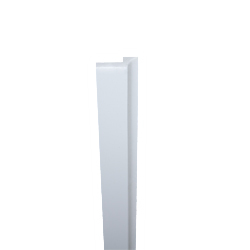 It is a small vertical piece that is included on any edge of the shower base that abuts a wall. It is ultimately concealed behind the wall panel, but rest assured that it is always there to make sure that water is unable to escape the shower base. Standard-Sized Modular Shower Bases are one-piece molded designs with no seams or joints. 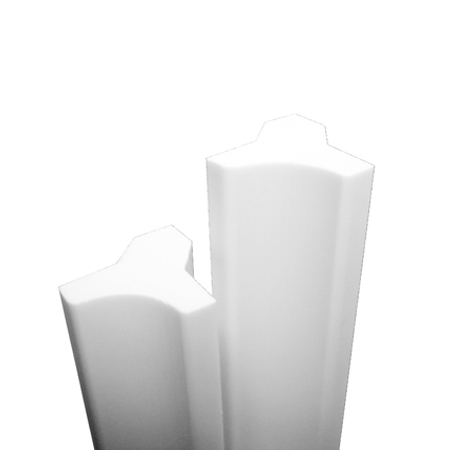 These bases come in industry standard sizes, however, availability varies by manufacturer. The fixed drain location is standard sized and drain orifices are typically a minimum of ¾” thick. The mold production process allows for soft corners to be incorporated into the design. 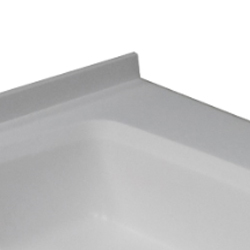 This prevents the base from having sharp corners, creating a safer base. Soft returns mean there are no right angles to scrub, and no places for dirt to get trapped. 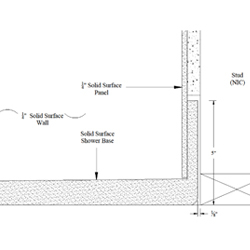 Water dams and thresholds may be integral or applied after the base comes out of the mold. 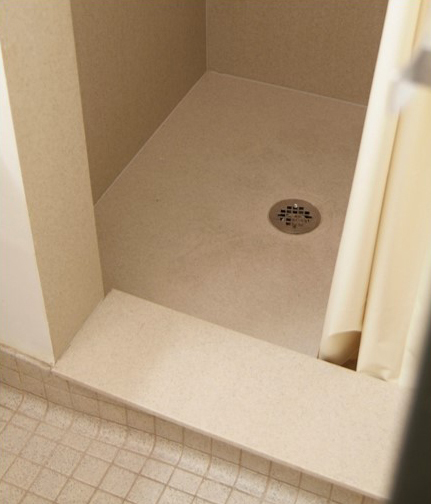 Fabricated, or constructed, shower bases are typically made from one or more sheets of ½” thick solid surface. 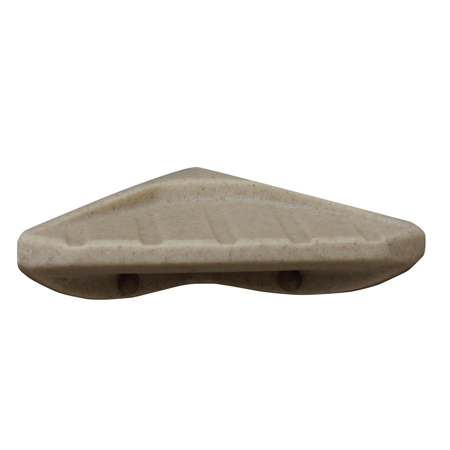 Because they are made with sheets instead of molds, they can be virtually any shape and size and can have a standard sized drain orifice placed almost anywhere. The floor is typically done with a matte finish, and is usually not available with a slip-resistant texture. Sizes greater than 30” in any direction will have seams in the shower floor. Once the drain placement is decided, the floor can be tapered so water goes to the drain by thermoforming. 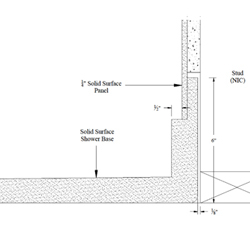 The void under the shower created by the tapering process can be filled with structural foam or another material. Water dams are usually fabricated in the shop with the threshold being attached at production or sent separately to be stalled at the job site. Thresholds can be either raised or accessible depending on the need of the project. While this method is versatile, there are a few drawbacks. Some designs have square corners and edges, increasing the chance of a cut or scrape. However, these edges can usually be sanded smooth on site. Because the design requires sheets to be assembled, there will be right angles in the finished product, allowing for dirt and grime to become trapped in the corners. These areas are notoriously difficult to clean and can lead to build up over time. Lastly, the floor is considerably thinner at the drain orifice than its manufactured counterparts. Custom-Sized Manufactured Shower Bases offer the best of both worlds, allowing the versatility of a custom design, with the perks that come from cast, molded product. They can come in any size, have variable drain location options, and yet the shower floor is cast as a single monolithic piece with no seams, joints or voids within or underneath. 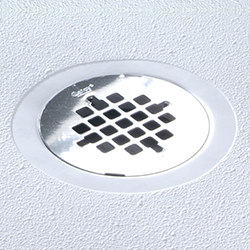 The standard sized drain orifice can be placed almost anywhere in the design, while still maintaining the ¾” minimum thickness. Most are available with a textured shower floor and the water dams are applied at the plant. 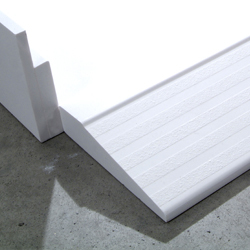 The raised or accessible thresholds can be either installed at the plant, integrated into the mold, or shipped separately to be installed at the job site. 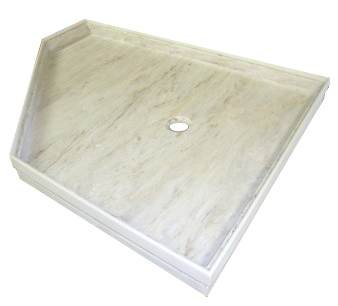 Custom-Sized Manufactured Shower Bases offer the best of both worlds. 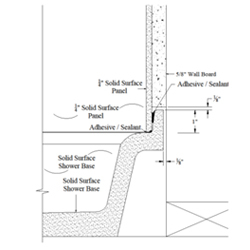 Single-height water dams on custom-sized shower bases require the bottom of each panel to be scribed to the slope of the shower base. This task is not exceedingly difficult for an experienced installer, but if the panel isn’t scribed correctly, it can look unsightly and result in costly replacements. Stepped water dams usually come from the water dam being installed after a custom shower floor has been manufactured. Even though the water dam is added later, the step itself is level, therefore no additional changes need to be made to the wall boards or panels. 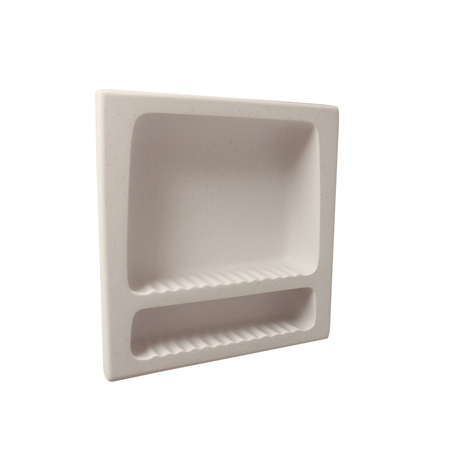 Standard shower bases come with the water dam as part of the mold design. This means the curb that the wall panel and wallboard will rest on is level. 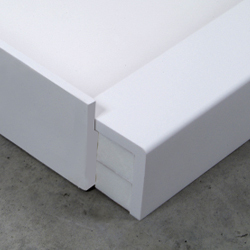 If the base is installed on level, no additional changes need to be made to the wall boards or panels. This style is the best, as there is no additional work for the installer. Some architects design showers with more than one material, like having a solid surface base with tile walls, but solid surface wall panels allow for uniform color and style throughout the entire shower. The industry standard size is ¼” for all vertical applications like wall covering. For free-standing applications, they can also be cast into panels as thick as 1” to be used as stall partitions for standalone or communal showers. 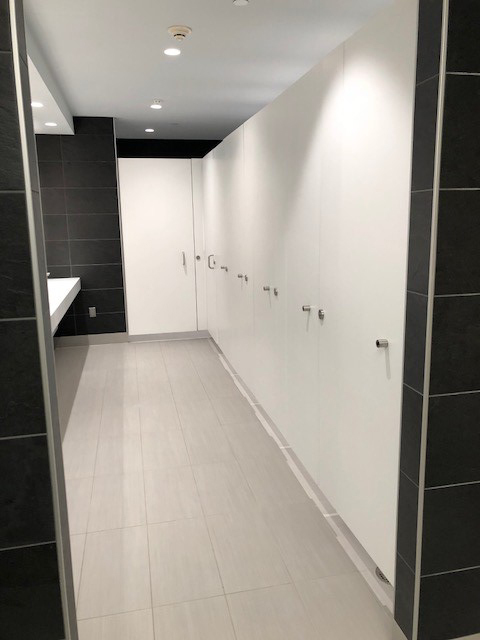 There are even options for floor to ceiling panels to provide full privacy shower units in lockers and residence hall bathrooms. The largest practical size for transport is typically 60” x 96”. Any larger than that, and the panels face the prospect of warping or breaking during handling. 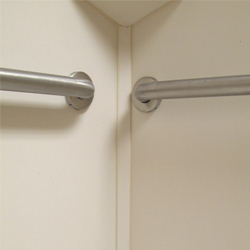 Larger designs are possible with the panels being field-seamed at the jobsite or joined with trim strips. 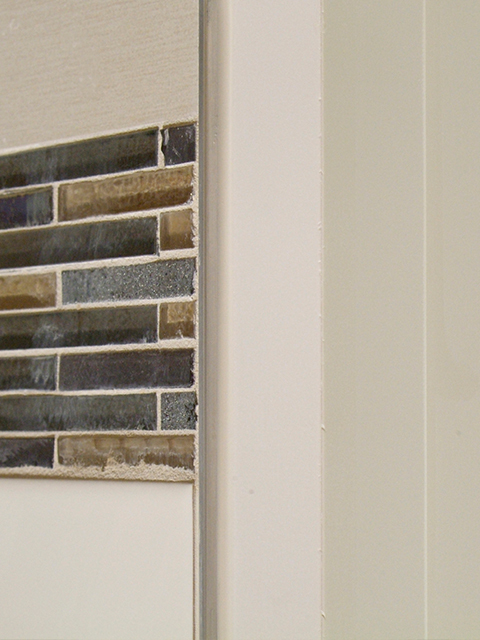 With the one-piece design that eliminates grout lines, solid surface wall panels are easy to clean and maintain. The surface is also renewable, so if it is scratched or damaged, it can be sanded and refinished so that the shower panel appears almost like new, as the color goes through the entire surface. The panels are also much quieter than fiberglass showers, which can sound almost thunderous during a shower. 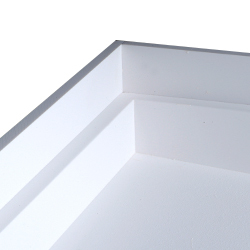 Shower trim moldings are used to conceal gaps at scribe points, simplify installation and provide decorative detail. Something to keep in mind when adding them to your design is the more moldings you use, the more crevices you create, which means more places in which moisture, mold, mildew and bacteria can hide. To guard against this, waterproofing and caulking are highly recommended. Accessories can not only add convenience to the user, but they can add personality to a shower. Standard Accessories are one-piece manufactured components. They are easy to clean, with no crevices for mold, mildew, and bacteria to hide. Manufacturers have dozens of options to choose from, but if you have a custom design you would like to add, the versatility of solid surface makes it possible. You could even add your logo to a shower design if you wanted! You could even add your logo to a shower design if you wanted! 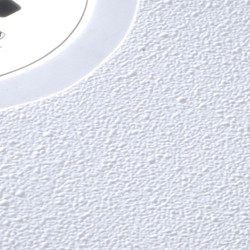 It’s ultimately up to the architect where to specify solid surface showers, but CSI prefers that it specified under 06 61. It can also be under commercial showers or healthcare showers, but it is not architectural woodwork, and usually not a composite fabrication. There are other benefits to specifying it under 06 61, but that is something you should discuss with your salesperson. Solid surface is, by definition, a cast polymer. This is an accurate category; however, you can be more granular. Given its stone-like appearance with certain colors, you can accurately specify it under this category. This is a perfect category. It can not only cover your solid surface showers but any products made of solid surface including counters and wall coverings. 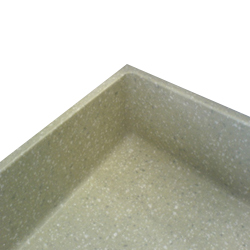 Solid surface showers can be specified here, but it is more accurate to use other categories. As stated above, you can use this category, but it may be beneficial to use another specification. Your salesperson can give you more information. Solid surface is often compared to wood when it comes to cutting, scribing, and sanding, as many of the same tools are used. 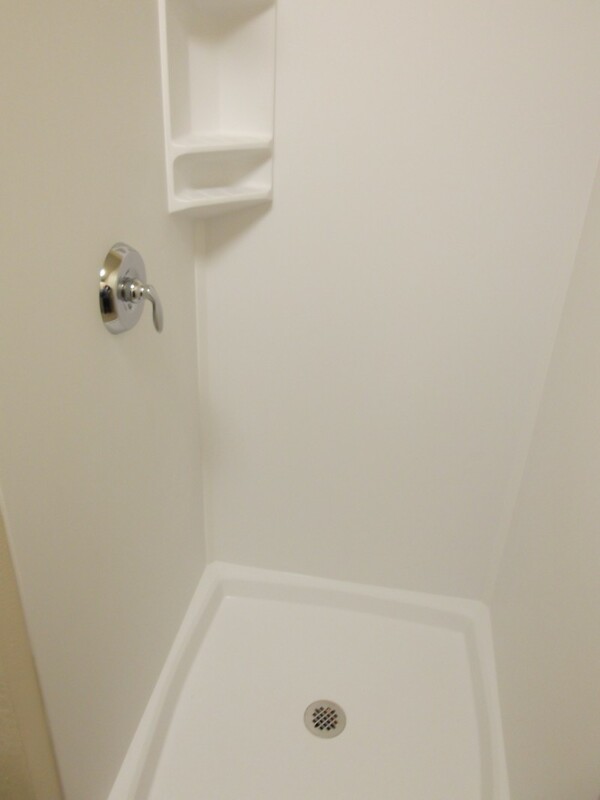 Regardless of which types of bases and panels you choose, be sure to pay the utmost attention to the manufacturer’s recommendations, as missed steps can result in an unsafe shower. There are different techniques for different setups, especially when it comes to water dams. Pay the utmost attention to the manufacturer’s recommendations, as missed steps can result in an unsafe shower. As I’ve mentioned before, solid surface is a very versatile material. The fact that it can be poured into molds, and be further sculpted using heat and sanding, means you can make almost any design you can imagine. Over the years this has led to some very unique designs, including a very out-of-the-box period in the 90’s. With the growing popularity of unisex bathrooms, the demand for floor-to-ceiling partitions has grown in popularity. 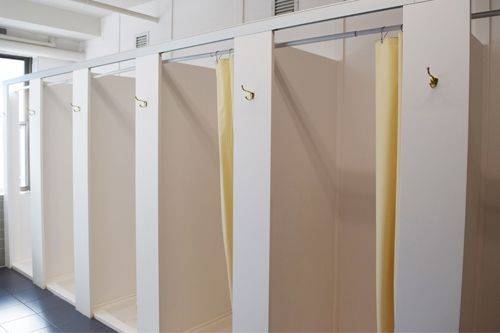 Communal showers are slowly fading into obscurity as more institutions are moving towards floor-to-ceiling partitions to create individual stalls using solid surface partitions to save on time and materials. There are also instances of these partitions being used to create individual pump rooms for new mothers at work. Showers shouldn’t just be utilitarian; they should be aesthetically pleasing. While solid surface is an amazing material, there are some looks that people prefer more, like natural stone, or tile. 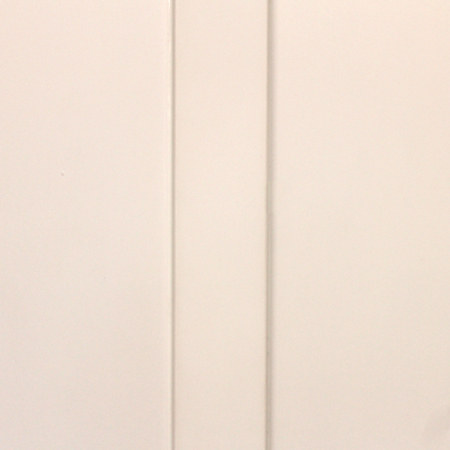 Those can be implemented easily enough, but solid surface can be made to mimic both materials. Tile is, and always will be, a timeless classic. It has been in use seemingly forever. It was a material of choice in ancient Egypt. While it is fun to look at, there have been a number of advancements in technology since then. Solid surface panels are flat when they are cast, but they can be milled in a CNC machine to create the look of tile grout lines. This gives you the beauty of tile without the hassle of mold, mildew, and deterioration most commonly associated with grout. Solid surface shower wall panels start life as a series of pigments, powders and resins that are mixed and poured into a mold. During that process, technicians can manipulate the mixture to duplicate the flowing patterns of marble and granite, while maintaining the ease of maintenance solid surface is known for. Once the panel is cured and installed, most people would not be able to easily tell the difference. The demand for floor-to-ceiling partitions has grown in popularity. Although the phrase “solid surface” makes it sound like one, large seamless piece, often this isn’t entirely true. Showers can be constructed using multiple large panels of solid surface materials installed in a such a way that they appear seamless, and a solid surface sink can be expertly joined to a matching solid surface countertop so that no seams are showing. Cast shapes are fabricated in one solid piece, and the surfacing experts and installers fit these pieces together in your commercial or residential space so that the edges are practically invisible, giving the illusion of seamlessness. 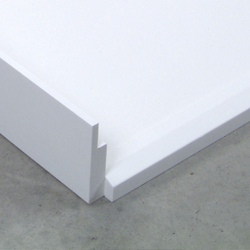 Why choose solid surface? Because it lasts for a very long time, is extremely versatile, and it looks great.